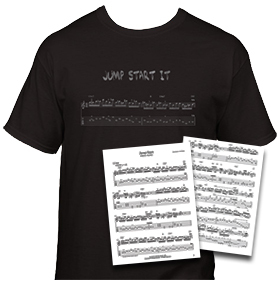 'JUMP START IT' T-SHIRT & INTROSPECTION TABLATURE BOOK W/ BACKING TRACKS! Available for a limited time is the Greg Howe 'Jump Start It' t-shirt & Introspection tablature book w/ backing tracks package! This t-shirt is available in S, M, L, & XL.